Andy Warhol (American, 1928-1987). 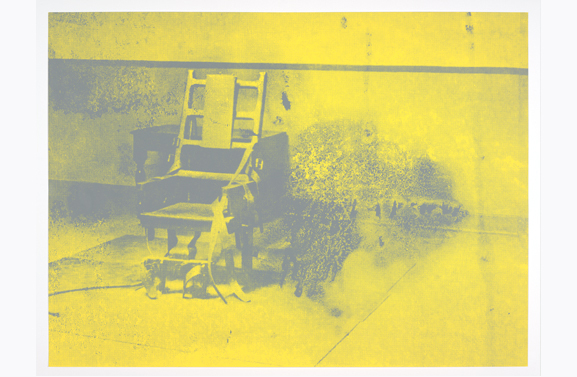 Edition ?, 1970, Screenprint, 38 1/8 x 38 1/8 in., 2006.161, Collection of Jordan D. Schnitzer, © 2015 The Andy Warhol Foundation for the Visual Arts, Inc. / Artists Rights Society (ARS), New York. Andy Warhol (1928–1987) depicted the world with the volume turned up. Employing a seemingly endless palette, his work has challenged our perceptions of popular culture, politics, and consumerism for more than fifty years. Warhol was the central figure of American pop art, a movement that emerged in the late 1950s in reaction to the heroism of abstract expressionism. Warhol and his contemporaries sought to eradicate the notion of the “genius artist” and downplay the role of originality in art, adopting mechanical means of generating images such as screenprinting, which theoretically allowed for an endless reproduction of images. In drawing inspiration from the rapidly changing world around them, pop artists sought to be more inclusive in their subjects, and more aware of the day-to-day conditions of contemporary existence. 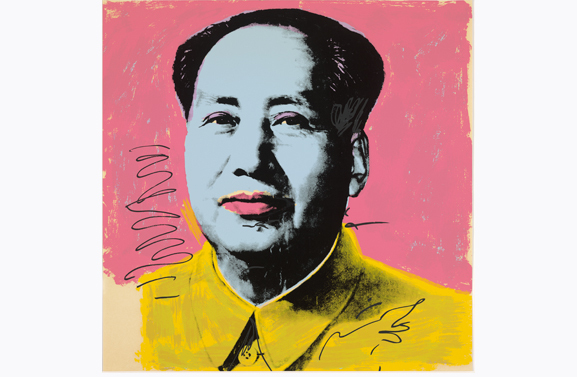 Spanning three decades of Warhol’s career, this exhibition featured some of the artist’s most iconic screenprints, including his portraits of Marilyn Monroe and Mao Zedong, the splashy camouflage series, and the controversial Electric Chair portfolio. Drawn exclusively from the rich collections of Jordan Schnitzer and his family foundation, In Living Color was divided into five sections—experimentation, emotion, experience, subversion, and attitude. In each, Warhol’s work was placed in conversation with that of other artists of the postwar era who use color as a tool to shape how we interpret and respond to images; these included Louise Bourgeois, Chuck Close, Keith Haring, and Frank Stella. Andy Warhol (American, 1928-1987), edition 183/250, 1971, Screenprint, 35 1/2 x 48 in., Publisher: Bruno Bischofberger, Zurich, Switzerland, 2002.82a, Collection of the Jordan Schnitzer Family Foundation, © 2015 The Andy Warhol Foundation for the Visual Arts, Inc. / Artists Rights Society (ARS), New York. Andy Warhol (American, 1928-1987). 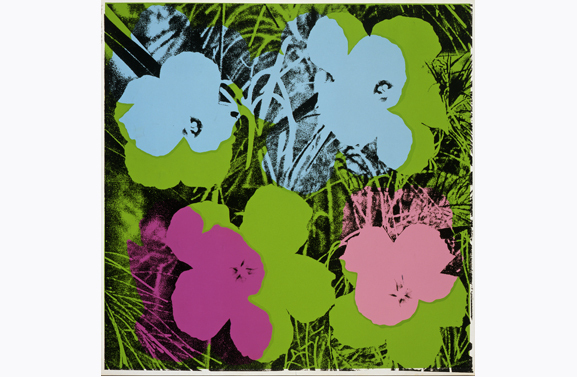 Edition 212/250, 1972, Screenprint, 36 x 36 in., Publisher: Castelli Graphics and Multiples, Inc., New York, 2000.123b, Collection of the Jordan Schnitzer Family Foundation, © 2015 The Andy Warhol Foundation for the Visual Arts, Inc. / Artists Rights Society (ARS), New York. Stella, Frank, (American, b. 1936). 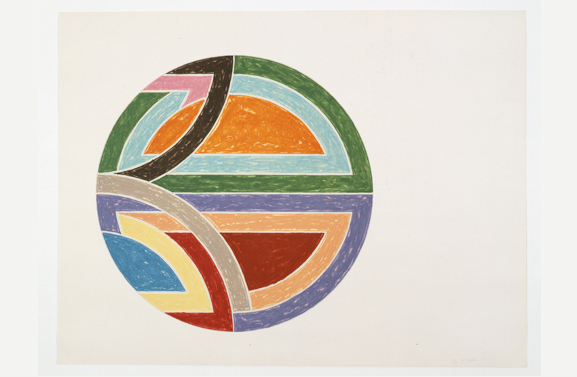 Edition 2/100, 1977, Lithograph and screenprint, 32 x 42 1/2 in., Publisher: Petersburg Press, New York, 2002.81a, © 2015 Frank Stella / Artists Rights Society (ARS), New York.